Are PARP Inhibitors Right for Me? PARP inhibitors are a new type of targeted therapy that represent a major breakthrough in cancer treatment, especially for patients of ovarian cancer and HER2-negative breast cancer who previously had limited treatment options. 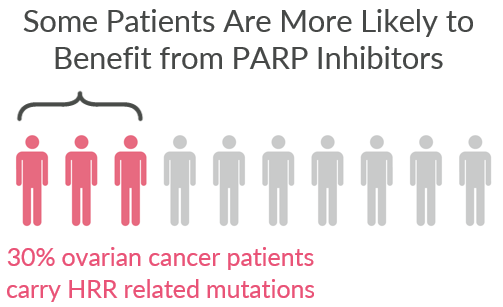 However, not every patient is a candidate for PARP inhibitors. Studies have shown that PARP inhibitors are more effective for patients carrying mutations in BRCA genes or other genes associated with homologous recombination repair (HRR) functions. Homologous recombination is a process that repairs damages in our DNA. If a tumor has deficiency in its DNA repair functions, the cancer cells are more likely to be destroyed by PARP inhibitors, making PARP inhibitors more effective. 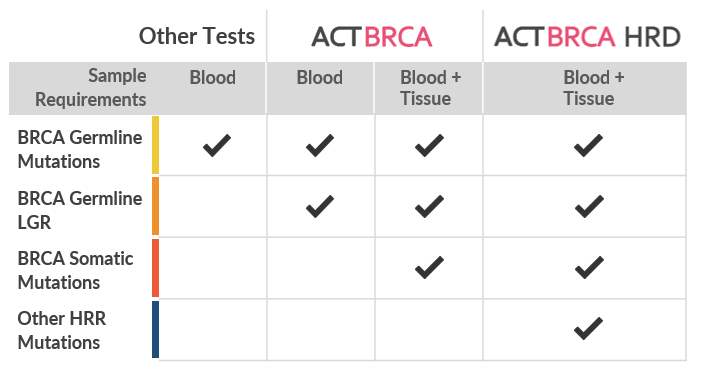 ACTBRCA® / ACTBRCA® HRD are genetic tests that can determine whether the patient is carrying BRCA mutations or other HRR-related mutations, helping physicians to evaluate whether the patient is likely to benefit from PARP inhibitors. Our tests cover more mutation types compared to common BRCA tests, and provide more complete information for physicians to decide if a PARP inhibitor is right for you. It is important to discuss with your doctor first as many factors need to be taken into consideration when making decisions about treatment. If you and your doctor decide that genomic testing is right for you, your doctor will order the test and assist in sending the required samples to our laboratory. - Venkitaraman AR. Annu Rev Pathol 2009; 4: 461-487. - Lord CJ. et al. Science. 2017 Mar 17;355(6330):1152-1158. - O&apos;Malley DM. et al. Mol Cancer Ther 2018;17(1 Suppl): Abstract nr LB-A12. - da Cunha Colombo Bonadio RR. et al. Clinics (Sao Paulo). 2018 Aug 20;73(suppl 1):e450s.